There are multiple entrances and parking garages on the Pacific Tower grounds at 1200 12th Ave. S, Seattle, WA 98144 (Bing Map | Google Map). Please review the directions below to help you get to the correct entrance and parking locations. Metro bus routes 36 and 60 stop right at the tower. Light Rail stops at Beacon Hill Transit Center. From there you can take Metro bus 36 northbound towards the tower. Take the James Street exit (165A) and turn left on James. Continue east on James and turn right on Boren Avenue. Then turn right on 12th Avenue. Continue on 12th over the Jose Rizal Bridge to Pacific Tower. Turn right on 14th. Stay to the right and turn right at the drive AFTER the tower. Go past the flag circle and park in the West garage. If the garage is full, or for disabled parking, continue onto 12th taking a right, and turn right into the driveway on the north side of the garage and park in the surface lot on the north side of the tower. Do not park in the Pacific Medical Clinic Garage on the east side of campus right off of 14th. Take Exit 164A for I-90 E and Dearborn/James Streets. Keep left at the first fork, toward Dearborn/James, and then keep right for Dearborn. Turn right on Dearborn. Then turn left on Rainier Avenue S. Take the first left onto S. Weller Street. Turn left on 12th Avenue S. Continue on 12th over the Jose Rizal Bridge to Pacific Tower. Turn right on 14th. Stay to the right and turn right at the drive AFTER the tower. Go past the flag circle and park in the West garage. If the garage is full, or for disabled parking, continue onto 12th taking a right, and turn right into the driveway on the north side of the garage and park in the surface lot on the north side of the tower. Do not park in the Pacific Medical Clinic Garage on the east side of campus right off of 14th. Exit at Rainier Avenue North. Continue north on Rainier Avenue (straight through the light at Dearborn). Take the first left onto S. Weller Street. Turn left on 12th Avenue S. Continue on 12th over the Jose Rizal Bridge to Pacific Tower. Head east over the West Seattle Bridge/Spokane Street. Take ramp to Columbian Way S. toward Columbian Way/15th Ave S. (East). Turn left at the first light onto S. Spokane Street). Turn left again at next light (one small block) onto 15th Avenue South. Continue north and turn left on to S. Atlantic Street. Turn right onto 14th S.
After you pass S. Judkins on the south edge of the campus, turn left at the drive BEFORE the tower. Go past the flag circle and park in the West garage. If the garage is full, or for disabled parking, continue onto 12th taking a right, and turn right into the driveway on the north side of the garage and park in the surface lot on the north side of the tower. Do not park in the Pacific Medical Clinic Garage on the east side of campus right off of 14th. Visitors can enter at either the North or South entrances of the garage, pull up to the gate arm, and pull a ticket. When leaving, visitors enter their ticket and pay by credit or debit card. No cash is accepted. Please press the button on the ticket dispenser if you encounter issues entering or leaving the garage. Additional parking for $6 for all day is available in the north parking lot, which is accessible from 12th Avenue. There is one pay station at the entrance to that lot. 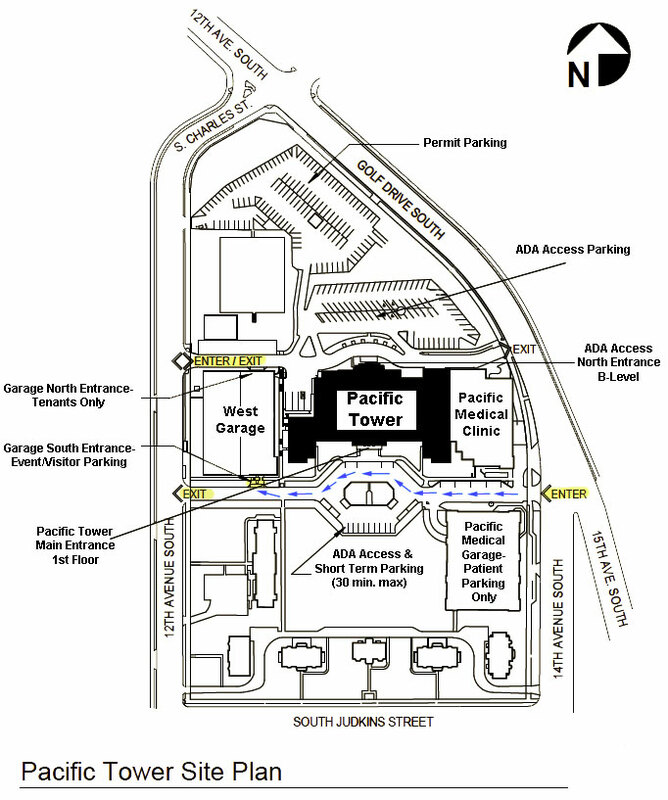 ADA parking is located in the North Lot (enter building through North entrance), and as you enter on 14th Ave, around the flag circle in front of the South main entrance. Street parking is also available.